I suppose you would say it was serendipity: a happy accident that led to the discovery of my great grandfathers diary, although it had been in the County Record Office for some time. 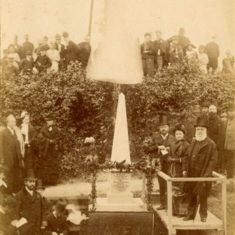 It was drawn to my attention by one of the staff that a well-known local memorial had been made by a man by the name of Peck. This in turn led to family papers, including a diary [ref D/EHxB20], covering the years 1860 to 1863. Who was this man and what sort of life did he lead? 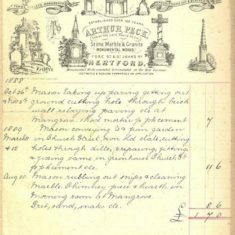 His name was Arthur Peck and he was born at 7am on the 2 December 1838 in Fore Street, Hertford, and was the fourth child of David and Eliza. The house where he was born, Peck House, still stands. In the Nineteenth Century, at the front of the house, there was a Stonemasons yard, one of two owned by the Peck family. Arthur started the diary when he was 21. 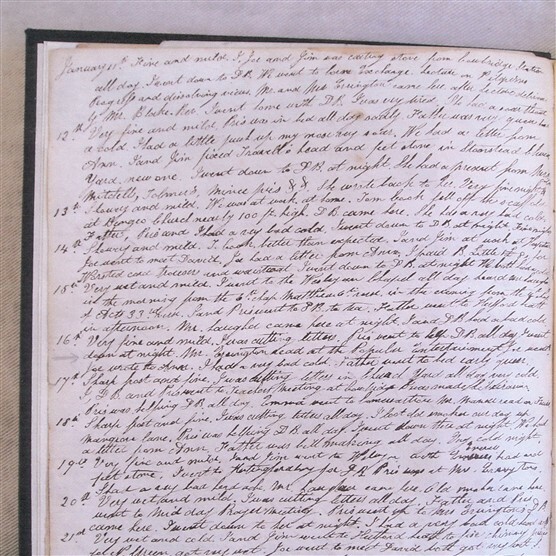 Written in a very small hand, it reveals a surprisingly busy and varied life considering there was very little entertainment compared with today. But it is to his working life that we must turn first. On the 29 September 1862 he wrote: ‘I have been at work in the yard ten years today’, which is to say he started work when he was not quite fourteen. His work would have taken him to many places in Hertfordshire and sometimes beyond. 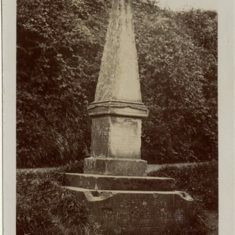 On the 4 October 1860 for example he states ‘I went to Potter Street meeting ground (near Harlow) to cut and black Miss Lodges name on an old head and foot stone. I walked over ten miles’. Among the many other places mentioned are Weston, Welwyn, Munden, Ayot St Lawrence and Wormley. Very often the journey would be made with horse and cart, pony and even at times by train. What becomes clear is that the Peck family business was well known and respected. Their customers included Lord Cowper and The East India Company. The work could be very hard at times especially the moving of stone. Large blocks of Bath, Portland and York stone would arrive by rail or barge and needed to be carted to the yard before work could begin. On the 2 September 1860 the truck broke twice when carting a 4.5-ton block of Portland stone. There were other dangers too. The entry for the 3 January 1860 records that ‘Tom Cook fell off the scaffold at Bengeo Church, nearly 100ft high’. Surprisingly he survived and the following day Arthur records: ‘T. Cook, better than expected’. 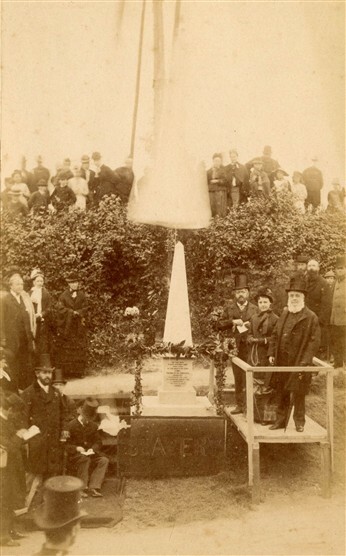 The work itself was varied and included carving, paving, fixing sinks and chimneys as well as the memorial work. Some idea of the scope and quality of the work can be gained from this bill of a later date (1889) when Arthur was running the business. In spite of the skill and effort involved however, the work was not well paid, and it was this that precipitated something of a crisis in Arthur’s life. On the 25 February 1861, following a row with his father over money, he left home to find work elsewhere. 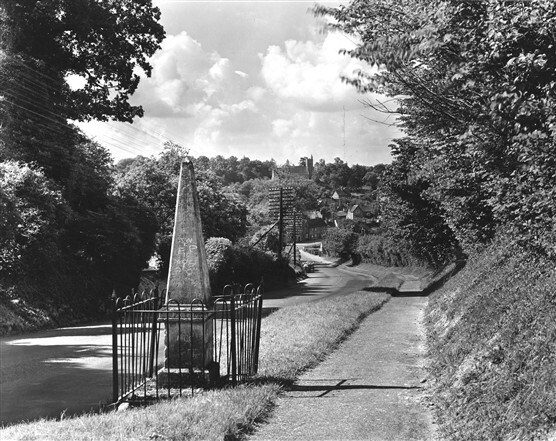 From Hertford he walked first to Bishops Stortford and then on to Dunmow, where he arrived at half past nine at night. The next day he carried on to Braintree and then Chelmsford where he found work with a Mr Archer. He returned home briefly a month later but went back and continued to work in and around Chelmsford. However, there were still problems regarding money and he was not destined to stay. 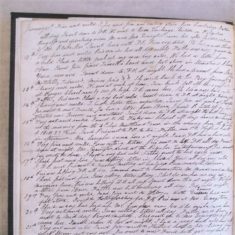 On the 27 June he states: ‘I had a letter from Mother wishing me home’, and on the following day he went back to Hertford and the family business for good. Life seems to have continued very much as before, and he certainly would have been eager to renew his friendship with a young lady who is only referred to by the initials DB. They saw each other most days: ‘I went down to DB at night’, or ‘DB came here’ were frequent diary entries. 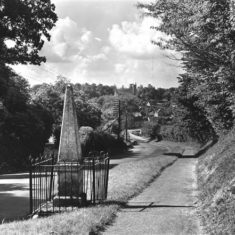 Sometimes they would go for a ride in the pony and trap, perhaps to Digswell Viaduct as on 3 April 1863; at other times Arthur would meet her as she was making her way home from one of the big houses where she worked as a dressmaker. On the 2 June 1862 Arthur records ‘DB went to Tolmers [Park], I walked through Bayford to meet her’. At times though her work took her further afield, even going as far as Wrest Park in Bedfordshire. One intriguing entry is that of the 17 Oct 1863, which reads as follows: ‘I have promised if anything happens to me, Betsy Denmark is to have half my insurance money as agreed’. Was DB in fact BD (Betsy Denmark)? It is quite likely, as Arthur married Betsy early in 1864. The family too was central to Arthur’s life. The immediate family would gather for Christmas, which would usually include David, the eldest brother and his family, who would travel from Watton for dinner. After lunch the younger brothers would sometimes go hunting for rabbits, or even go skating on the river if the weather permitted. Birthdays of course were remembered and there is rather a nice entry for 1862, which records that the family clubbed together to buy their Father an easy chair, the price of which was 25 shillings. More distant family members, those at Malton or Southend, usually kept in touch by letter, but there was also much travelling to Watton, Luton and Harlow to visit those closer to hand. They had their differences of course, and Arthur recalls his Father as sometimes being rather miserable, no doubt because of business worries. As for the younger brothers and sisters they could be quite fiery. Nevertheless, you have to wonder what was said to make Emma throw an open knife at Arthur, or to make Joe throw a hammer at a workmate. Given the limited amount of spare time he must have had, Arthur’s life was surprisingly varied. He was a member of a local chess club where on 13 Oct 1862 he played a North American Indian by the name of Kemp. There was also something called the Popular Entertainment, which took place at The Corn Exchange. Arthur makes a special note of a 21st birthday party for Joannah Jackson at Brickendon, which he obviously enjoyed – ‘we sung all the way home’. Most of Arthur’s leisure time though seems to have been spent outside. He was a great cricketer, starting in late April and playing both home and away. He also spent a lot of time rabbit shooting, and ferreting with dogs, sometimes at night. This had the additional benefit of supplementing the family diet. In addition there was the usual round of agricultural shows as well as [horse] races at Hatfield and Harpenden. Sometimes the Circus would come to town and there must have been a certain amount of panic on the 2 July 1861 when a Lion escaped. As already mentioned, animals were a part of everyday life in the Peck family and business. However, they were not kept for sentimental reasons, and all were expected to pay their way. Horses of course were required for haulage and there was also a pony and trap, which was most often used by Arthur’s Father. The pony could be very difficult at times and rather than allowing himself to be put into harness would sometimes lay down in protest. On the 24 June 1862 it broke out causing a great deal of trouble as Arthur wrote: ‘I was out from six in the morning till ten trying to catch the pony. Went all round Bramfield, through standing corn, got wet through’. Pigs and chickens were also kept and the chickens seem to have had a particularly hard time of it. In cold weather they might freeze to death and they were always at risk if they got anywhere near the pig, which would eat them. Both Arthur and his father served on the Jury at the local Assizes. He also appears to have sat in the public gallery at times. 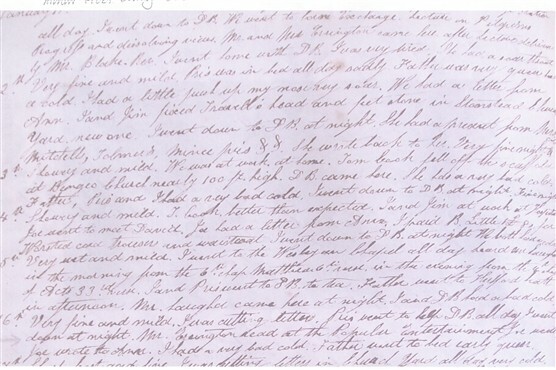 The entry for the 12 July 1860 reads ‘I went in court in the afternoon. Heard three men tried for murder – shooting a keeper – got clear of it then charged with poaching’. There seems to have been quite a bit of crime, which included a series of robberies in the first week of March 1862, and a week later ‘a man was stabbed and ill treated in the North Road’. 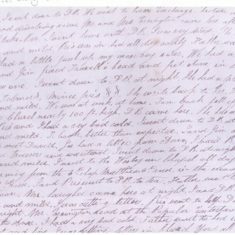 There are, throughout the diary, references to the weather, including the fact that it was cold enough, on the 10 January 1861, to play a cricket match on the ice, and in July of the same year he wrote ‘1 saw a comet while walking up Springfields’. The bad weather would sometimes have even more serious repercussions such as the occasion in June 1863 when a tree in Hertingfordbury was struck by lightning, and a man and three cows were killed. 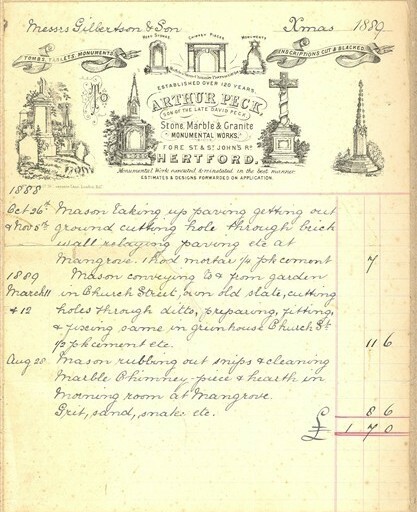 Arthur also mentions the prices for various items, including a pair of braces for 2s-3d; a Sunday Suit for £3 -13s; a ferret (which bit him) for 2s-6d and the cost of shoeing the pony 2s-8d. Taken as a whole, the diary suggests that Arthur was not one to let life pass him by. The entries conclude in December 1863 and the following year he married Betsy. No doubt he continued to lead a very busy life, eventually taking over the running of the business on the death of his Father. Much of the work done by the Pecks can still be seen in and around Hertford including that on Mill Bridge, now sadly showing the effects of the weather. 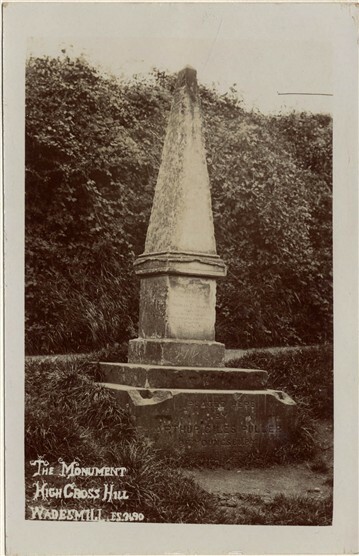 But perhaps one thing more than any other serves to remember the life and work of Arthur Peck; the very thing that kindled my interest in the first place; the Memorial – now refurbished – to commemorate the work of the anti-slavery campaigner, Thomas Clarkson.